The orchid I’ve chosen to feature this week is super interesting in terms of its contribution to science, courtesy of one Mr. Charles Darwin. Charles Darwin is best known for his theory of evolution; many biology classes educate students about his work with finches and tortoises on the Galapagos Islands. 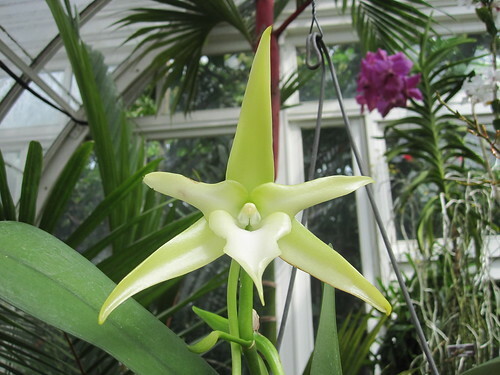 Less widely known is Darwin’s work with orchids, though when you consider the vast array of evolutionary variety in the orchid family, it’s not surprising that he took an interest in them. 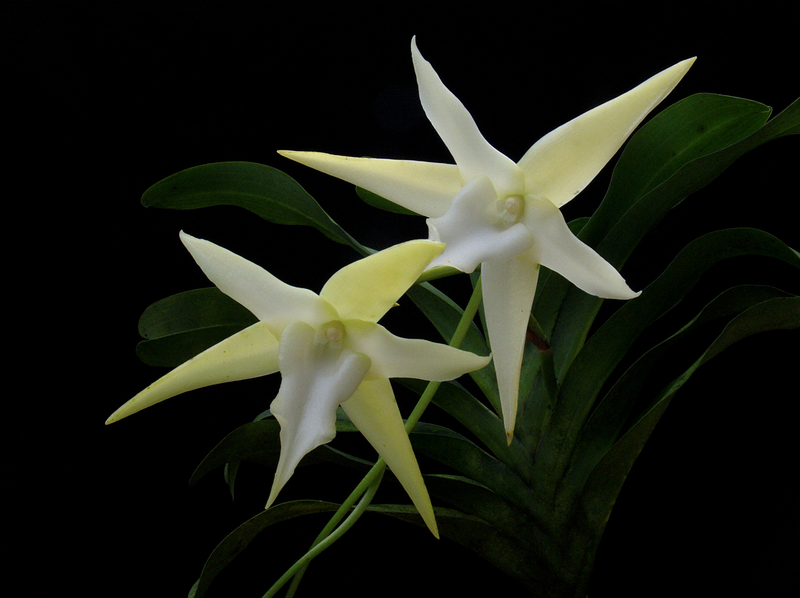 Darwin is most often associated with the Angraecum sesquipedale, AKA Darwin’s orchid, Christmas orchid, and Star of Bethlehem orchid. Considering the hard-to-reach pollen inside the spur, Darwin wondered how fertilization could possibly take place. He experimented with pollinating these flowers and theorized that a (then-undiscovered) moth must have evolved a proboscis long enough to reach the nectar in the bottom of the spur. The moth would trigger the release of pollen while withdrawing its proboscis, which would allow it to fertilize another flower by inserting its pollen-coated proboscis to get to more nectar. Years after Darwin’s death, this very moth, a ‘hawk moth‘, was discovered in the same region where the Angraecum sesquipedale lives. Darwin FTW! Very nice! I knew nothing of Darwin’s work with orchids. I love reading your posts! Keep up the good work! Great information. It fullfills my continuing education need. The sad part is, the moth wasn’t found until after his death, he never got to see it. Wow, that video of the moth and the flower is freaking amazing!! Thanks for sharing!